Article first published as Smashed Potatoes on Blogcritics. As much as I love rice, there are just some dishes that are better paired with potatoes. With the recent Batter Fried Chicken I made, I accompanied them with these Smashed Potatoes. These potatoes are rich, slightly creamy and one of the first things finished off during dinner. It couldn't be any simpler to make as well! 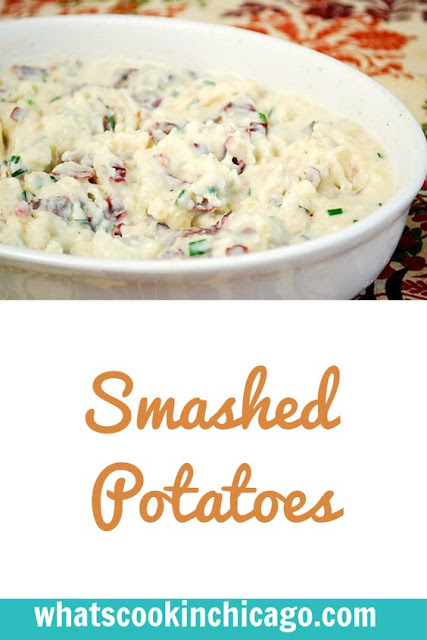 If you need a differed potato recipe to try, these Smashed Potatoes is a definitely winner! So the secret to making these potatoes is 2 fold. First, the potatoes are key. This recipe is perfect if using red bliss potatoes or even baby Yukon gold potatoes. They come out naturally creamy and flavorful rather than starchy and bland. Second, the addition of cream cheese (plain or veggie flavored) adds a really nice richness. You can mash the potatoes up as smooth as you want, but I prefer serving it with a little texture. Boil potatoes in water until tender, 15 minutes. When the potatoes are tender, drain and return them to the hot pot to let them dry out a bit. 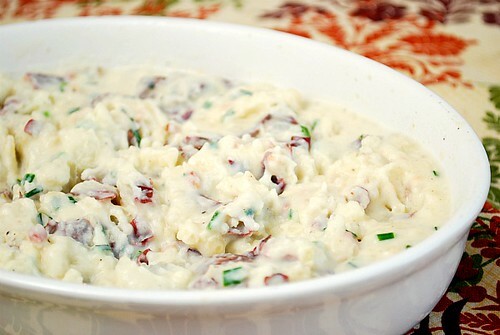 Mash potatoes with half-and-half or milk using a potato masher. Add the cream cheese and smash until the cheese melts into the potatoes. Then add chives and season with garlic powder, onion powder, salt and pepper, to your taste. It looks delicious, I love potatoes and veggie cream cheese. Those are the two of my favorite things and now they are together. This is gonna be a great recipe. Definitely got to try this one out. Thanks for sharing with us. Yummy!! Had them with the Korean ribs!